"On the Dignity of Life... Including the Aged and the Poor"
Along the way, the diminutive, bright-eyed sister with a fondness for a good joke has learned what it takes to create an environment in which a diverse group of elderly people can continue to participate in life until their final moments here on earth. Read more about Sr. Anthony here. 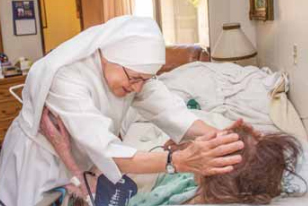 Learn more about Little Sisters of the Poor here.